According to production house ZIP Cinema, The Priests wrapped production in Paju on 4 June, after three months' filming since early March. Developed from director JANG Jae-hyun’s short film 12th Assistant Deacon which won multiple prizes at festivals including Jeonju International Film Festival and Mise-en-scène Short Film Festival last year, the story is about two Catholic priests who voluntarily get involved in a mysterious incident in their attempt to save a girl from danger. Actors KIM Yun-seok and GANG Dong-won have once again partnered for JANG’s first commercial feature film, following their collaboration in 2009 for period comedy Woochi. “There are many compulsive scenes that are full of energy. 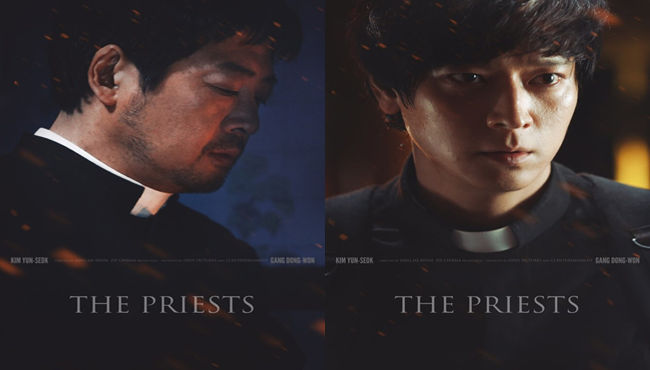 The Priests will surely present a whole new style of Korean cinema. Audiences will be able to see that such a film can be made and seen in Korea,” said KIM. The Priests was first introduced to international buyers at the Hong Kong Filmart held in March. The film is tentatively set for release in the second half of this year.